Folksy :: Buy "Fragrant Lavender Heart"
This is a highly fragrant lavender heart made in pretty cottons in shades of lilac/purple. 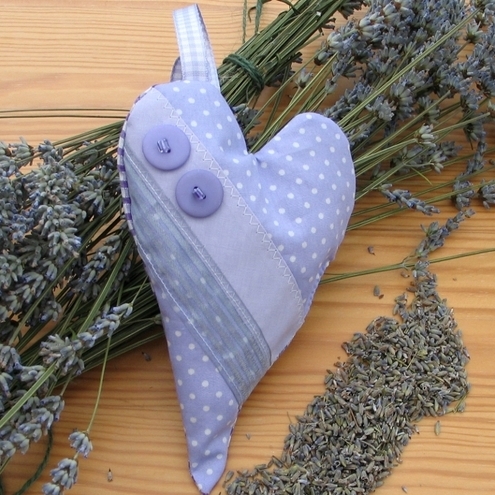 The heart measures approx 6" at its deepest and is filled with high quality lavender. One side of the heart is polka dots and buttons, the other is gingham and beads so you can ring the changes! Folksy :: Buy "fabric bird with lavender "
Folksy :: Buy "Crayon Roll"
Folksy :: Buy "Crocheted Fingerless Gloves/Wristwarmers in Cotton"
Folksy :: Buy "hand made Cotton baby dribble bib(brown/dino)"